(Here's another one for Jeff.) 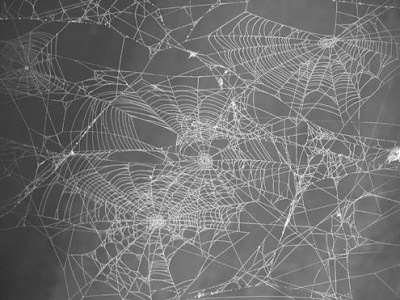 Long ago, a small, brave spider named Oorld crawled all the way around the Earth, spinning and weaving a long, long web as she crept. The web collected all the stray ideas and loose thoughts in the world. Pieces of the web still exist--some have been made into earrings. Holding a piece of the web near one's ear allows a character to hear billions of voices--a fragmented chorus of opinions and alleged facts about whatever the user happens to be looking at. The main effect is to make the possessor extremely tired (-2 to all saves). if the third roll succeeds, the user will be permitted to use two Class II powers. You won me at "brave spider". The only part of The Last Unicorn that really got to me was the poor little spider.